The new flat and flexible version of the acclaimed QED Performance HDMI is designed to deliver superior video and audio performance whilst being able to fit into confined spaces between the TV and the wall. The Performance e-FLEX HDMI cable features all of the qualities of our Performance HDMI but with a specially designed 'e-FLEX cordage' to allow the cable to fit in tight gaps between the TV and wall. Because the cable benefits from the application of design secrets uncovered by our state-of the-art HDMI test suite, it delivers very low jitter for accurate timing of picture and audio data. This cable supports Deep Colour, 3D and 4K meeting the requirements of the latest HDMI specification. Here at QED we are so proud of the level of quality and performance achieved with our cables that we offer a lifetime guarantee. 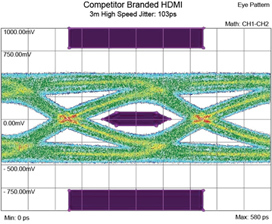 The eye diagram above demonstrates that a competitor’s 3m HDMI cable narrowly passes the test and exhibits up to 103 pico seconds (ps) of jitter; enough to allow ‘bit errors’ into the video signal. 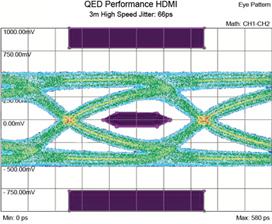 The diagram below shows the results of an identical test on a 3m QED Performance e-Flex HDMI cable. The eye is much more ‘open’, showing superior headroom compared with the competitor cable. Importantly, Jitter is reduced to just 66 pico seconds, significantly reducing the incidence of bit errors reaching the TV and maximising the audio and video data transfer.